Grab your scrap bag and make this lovely Mini Dresden Plate Wallhanging! Eleanor makes it quick and easy with her innovative techniques! The pattern contains a yardage and cutting chart to make the 26" x 26" Quilt. A free acrylic template for the Plate wedges is included with the pattern. 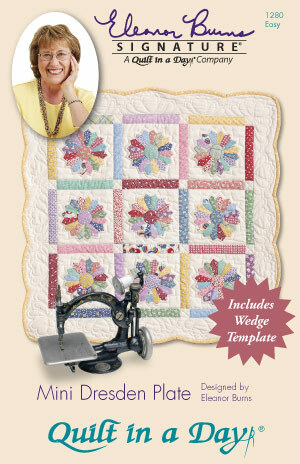 Purchase the Scallops, Vines, and Waves Template to finish your quilt with the scalloped edging.